Do you have a wisdom teeth infection? A wisdom tooth infection is NOT actually an infection of the tooth, but an infection of the GUM around the tooth! Wisdom teeth are at the very back of the mouth, so it's all happening right at the back there. It can be hard to see much! The first thing most people notice is that the gum is a bit sore over the wisdom tooth. It feels like they bit on something hard and grazed the gum a bit. They usually don't take much notice at this early stage. Then it gets a bit more uncomfortable. The next sign of wisdom teeth infection is a swollen gum - the gum around the tooth becomes puffy and starts to swell up. Sometime only a little, but other times a LOT. The gum will also get quite red and inflamed, although this can be hard to see! You need to get a really good, bright light and a good mirror. Then open your mouth, and pull your cheek away from the last tooth a little bit with a finger. You will probably see that the gum at the back of your mouth is more red than the gum at the front of your mouth (which should be pink). You may also see that the gum behind the last visible tooth at the back looks a bit puffy. If you see these 2 things, then you probably have a wisdom teeth infection. At this stage, you can help things by rinsing around the tooth with hot salty water. Just dissolve half a small spoonful of salt in a cup of hot water, and swish it around the sore gum. Really swish it around. Do this every hour or two, if you can. If things start to settle within 24 hours, you've probably caught it in time. 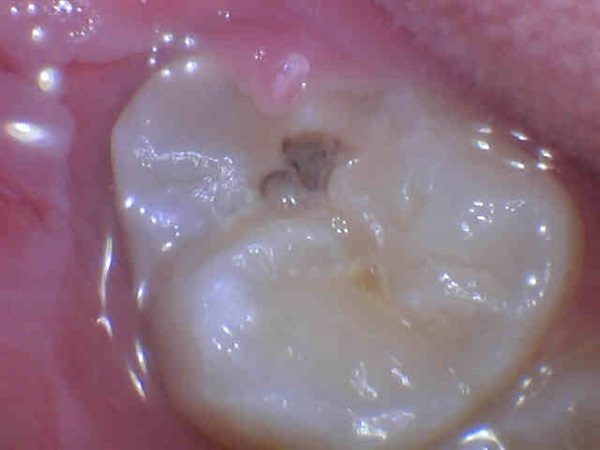 This image above shows a small flap of gum over the back of a wisdom tooth. It's slightly swollen - the first stage of a wisdom teeth infection. There's also a small cavity in the tooth. BUT even better than hot salt water is applying a high-quality aloe vera gel directly to the gum with your fingertip. The best gel on the market is from Forever Living. There is scientific research to support the effectiveness of aloe gel. Read more about this, and place your order directly online HERE. You can increase the chances of your wisdom teeth infection settling down by ALSO using a SONIC toothbrush. 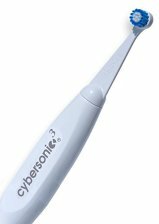 But don't get any electric toothbrush - get my top-rated sonic toothbrush, THE CYBERSONIC 3. If you use my special DISCOUNT CODE you can get the Cybersonic3 at around half price - that's just $50. You have to let this sonic toothbrush "buzz" gently over the sore gum around your wisdom tooth. DON'T press hard! Just let it massage the gum, for about 30 seconds in the one spot. THEN rinse out with plain water, AND THEN use the Therabreath mouthwash, for 60 seconds, swishing vigourously. Spit out. DONE. IF you follow these instructions carefully, your wisdom tooth infection may well settle down. . . if not, things will continue to get worse. It becomes painful to bite at the back, and you may also feel that you cannot bring your teeth together properly. With the gum swollen, it is being bitten on by the opposite tooth. This means that you feel like you cannot close your teeth together comfortably. When I see a patient at this stage, there is often an imprint of the top tooth into the gum over the lower wisdom tooth! Sometimes it's possible to get very quick relief by removing the upper wisdom tooth. Upper wisdom teeth generally are very quick and easy to remove, and you instantly get rid of the constant trauma onto the lower gum. Once you get that upper wisdom tooth removed, the gum over the lower tooth isn't being squashed by the top one anymore, and the lower gum has a better chance of settling down. It's even possible that the lower wisdom tooth may grow up through the gum normally! You should visit your dentist as soon as possible. He can rinse out the infected gum, prescribe some antibiotics, and take a look at whether removing the upper tooth would help. As things get worse, symptoms start to spread outwards from the wisdom tooth. You may start to experience difficulty opening your mouth as wide as you usually can. With a severe infection, there is a more generalized swelling in the area around the tooth. This can cause a "stiffness" in the tissues, making it hard to open your mouth as wide as normal. At this stage, antibiotics will help. The most common antibiotics for a wisdom tooth infection are Metronidazole ("Flagyl") and Amoxycillin. You can read more about this at tooth abscess antibiotics. Also, you should start doing some hot salt water mouthwashes - as hot as you can stand, and rinsing forcefully! Without antibiotics, the infection will probably get worse. Sometimes the combination of amoxycillin and metronidazole together will be more effective for serious infections. This may sound like an over-dose of antibiotics, but sometimes we have to hit these serious infections very hard as early as possible. The good news is that you can stop taking the antibiotics as soon as your symptoms have subsided, according to recent recommendations. By reducing the time that you are taking antibiotics, you are less likely to upset your normal stomach bacteria, and also less likely to contribute to antibiotic resistance. At this stage of the wisdom teeth infection, without antibiotics things are likely to get worse. Now things are starting to get serious. You may find that you are having difficulty swallowing. The swelling and inflammation around the wisdom tooth are starting to affect your neck. You may have a raised temperature, and feel hot. You will be sweating. You are running a fever. You should go to the ER. Wisdom tooth infections are painful but usually settle with hot mouthwashes and occasional antibiotics. But sometimes they can get more serious. It's better to visit your dentist sooner rather than later to find out what's going on!